As word gets out about the many design options available with porcelain tile, more and more people are asking how it compares to ceramic tile flooring. Porcelain is made up for a sand like material formed under high pressure and heat. Ceramic tiles are made from clay and other minerals and then fired to hardness. Those core differences result in some big benefits to homeowners. More water-resistant. Extremely durable. Beautiful. Affordable. There are some fantastic benefits in a porcelain tile floor. If you choose unglazed tile, the color in porcelain is through-bodied which means the color goes all the way through the tile - chips, dings and scratches (while unlikely in such a strong tile) are much less noticeable. Many homeowners prefer to go with glazed tile because of the design options that process opens. 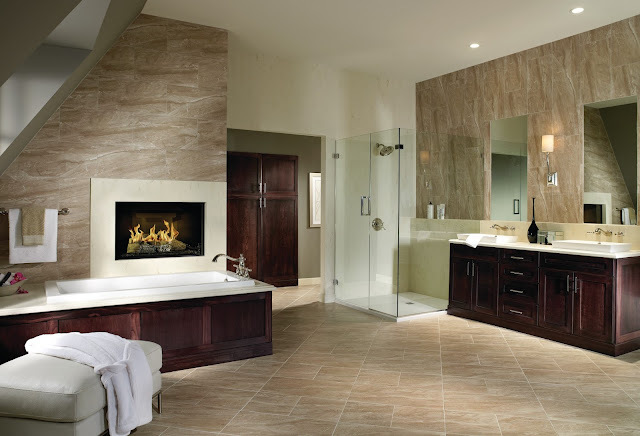 Glazed porcelain tile adds a top layer that can be created in nearly any type of floor. Granite, terrazzo, marble, even natural wood grains are design options in today's porcelain tile. Some manufacturers even offer very creative options such as leather or animal prints - all in a durable, easy to clean floor. Our in-house flooring experts love the benefits that porcelain tile brings to kitchens, bathrooms, three season rooms and living areas. If you're interested in porcelain for your home, stop by Kermans and ask our designers to show you options and help you narrow in on the best floor for your lifestyle and budget.